Pictured are members of the Gallia Academy Madrigals on Friday evening in New York City. The group attended “Wicked” on Broadway at the Gershwin Theatre. The choir members perform this Sunday at Carnegie Hall. NEW YORK, N.Y. — Nobody gets to Carnegie Hall alone. This weekend, 43 Gallia Academy Madrigals will be performing at the prestigious concert venue thanks to their own hard work and the support of their families, teachers, choir boosters and community members. The trip is nearly a year in the making, with Madrigals Choir Director Nattalie Phillips saying, those many months ago, she questioned whether the dream should be attempted but after talking with parents and choir boosters, they “went for it.” A big part of taking that leap of faith was a belief in the support of the community which has come through in a big way by donating to fundraisers for the trip. All of those creative fundraising efforts resulted in offsetting the costs by $300 per choir member, to give kids the opportunity of a lifetime. “We started the Madrigals Take Manhattan campaign and the community really got behind us,” Phillips said. This weekend, the Madrigals and their entourage of around 60 adults, are touring Radio City Music Hall, including backstage access and attending a performance of “Wicked” on Broadway, in addition to attending rehearsals for their performance on Sunday. Choir members will be rehearsing with acclaimed composer and conductor Andre Thomas. The group will also be visiting the 9/11 Memorial. As previously reported, the students earned the opportunity to perform at Carnegie Hall after competing in the Boston Heritage Festival last year when they and the Gallia Academy Symphonic Band traveled to Boston, Mass. with the World Strides organization. The Madrigals earned a Gold 1st Place rating in their category. The students will perform with approximately 400 other students from all over the nation while in New York City this weekend. Phillips said she hopes this trip is one her students will remember and talk about to their children and even grandchildren. She also said she wants the group members to learn the value of having a goal and knowing with hard work, you can reach it. https://www.mydailytribune.com/wp-content/uploads/sites/42/2019/03/web1_3.24-Madrigals.jpegPictured are members of the Gallia Academy Madrigals on Friday evening in New York City. 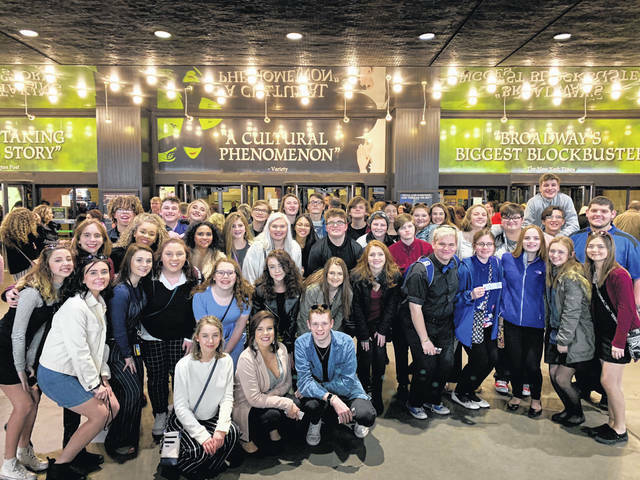 The group attended “Wicked” on Broadway at the Gershwin Theatre. The choir members perform this Sunday at Carnegie Hall.